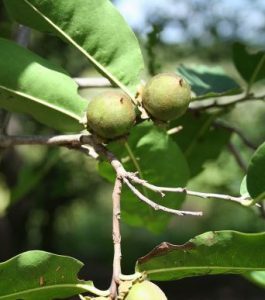 Diospyros mespiliformis is a tall, evergreen tree 15-50 m high, with dense, rounded and buttressed stem. Bark grey-black or black, smooth in young trees rough with small regular scales in older trees, pinkish when slashed. Young branchlets are green, tomentellous with pinkish-white hairs, glabrescent later. Crown is very branchy with dense foliage.